Second-hand bookshops are delightful. Hours can be lost in them and even amongst the most seemingly pedestrian selection of books treasures are waiting to be found. I discovered just such a bookshop a few weeks ago on a sunny Saturday afternoon. My husband and I went out to brunch and visited The Shire Book Shop in Franklin, Massachusetts. The bookshop is on the ground floor of a turn-of-the-century old mill building, it is large, and it most certainly does not contain a pedestrian selection of books. I walked in, turned to my husband, and informed him that I might never leave. I found it overwhelming at first because there are books and shelves and nooks and crannies and I didn't know where to start. I wandered aimlessly for a while simply admiring all the old books and then I got down to business. My book budget is reasonably limited and if I spent $40.00 on a book then that was likely to be the only book I would buy for the day. I am only going to do that if I come across something I can't live without. For a while, I felt like every book I pulled off the shelves was more than I wanted to spend but I decided to start with the paperback section at the rear of the store and I was more successful there. The shop is a jumble with boxes of books in front of shelves, stacked on chairs, and around every corner. I felt a bit as if all customers should be greeted at the door with a treasure map, preferably hand-drawn on brown paper, showing the location of all the different sections. However, it was equally fun to make discoveries on my own. I had a lovely chat with the bookseller. I asked if she had any old Penguins and she said I would have to search for them, they were all mixed in with the other books. She told me about a couple of her regular customers who come in a few times a year to add to their Penguin collections. I simply like Penguin books and will pick one up if it is a book I want to read but she has several customers who are trying to complete collections. We talked about Jane Austen and the yearly Jane Austen themed tea party she attends. She also made a few bookshop recommendations. She was a pleasure to talk to. So, what did I buy? I ended up having to spend endless amounts of time debating and putting books in and out of my final pile of purchases but the books below are the ones I brought home with me. 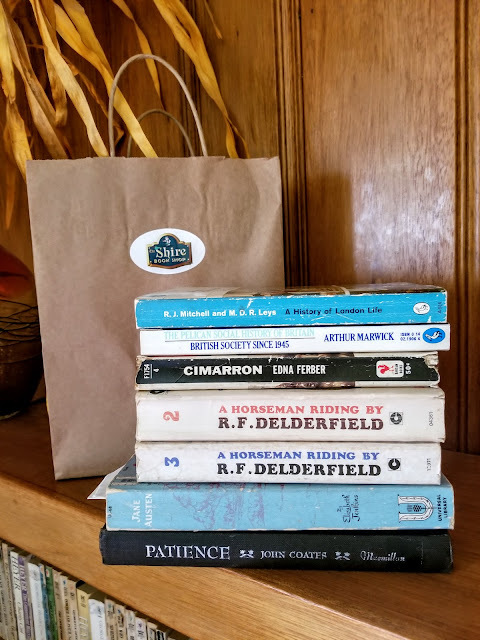 I thought I already owned the first volume of The Horseman Riding By trilogy but apparently, I don't so I will have to look out for a copy of that. I was pleased to find Patience. This has been reprinted by Persephone Books. Any book about Jane Austen is a good book to have. The Edna Ferber is because I just read her autobiography and now I am rereading her books. The two Pelicans are because I find books about social history fascinating. I had a very enjoyable visit to The Shire Book Shop and I am sure I will be back sometime soon. It is a wonderful place to while away a Saturday afternoon. And did I mention that they offer a complimentary cup of tea? Also, I think my in-laws had that exact same gold couch when I first started dating my hubby. What is the Austen book? I can't decipher the author's name. I am amazed at my own will-power. I know I will go back because there are books I am regretting. It was such a treasure trove type bookstore. The Jane Austen book is by Elizabeth Jenkins. The bookseller said she just put it out and that Jane Austen books never last long so if I wanted it I should buy it right away. What a fab place. I find that Penguins and Viragos seem to get snapped up - before I get to second-hand bookshops, either that or people don't ever part with them. I rarely see either of them but I live in hope and search every bookstore I come across. Sounds like a great shop - and lovely to have a friendly, knowledgeable proprietor too.